The Winnipeg Blue Bombers will have more than home-field advantage working for them Sunday when they host the Edmonton Eskimos in the West Division semifinal. Winnipeg's first home playoff contest since 2011 will be against an opponent the Blue Bombers swept 2-0 during the regular season. Winnipeg (12-6) halted Edmonton's seven-game win streak with a 33-26 home victory Aug. 17 and took the rematch 28-19 at Commonwealth Stadium on Sept. 30. However, the Eskimos (12-6) enter with momentum after finishing the regular season with five straight wins, including a 28-13 road victory over the Saskatchewan Roughriders (10-8) on Saturday to clinch third place in the West Division. Winnipeg cemented second place with a 23-5 road win Friday night over the Calgary Stampeders (13-4-1). 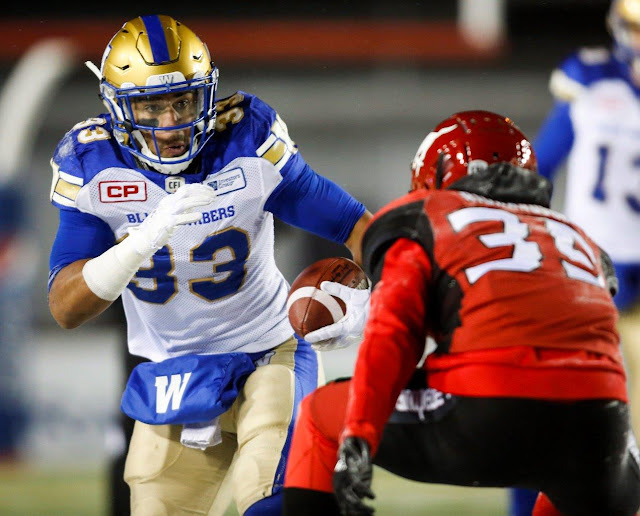 With incumbent Matt Nichols (leg) out, Dan LeFevour was 13 of 17 passing for 91 yards but the Bombers' defence forced seven turnovers (two fumbles, three interceptions, twice on downs). Nichols, who is expected to play Sunday, was the CFL's fourth-ranked passer with 4,472 yards but also had 28 TDs - two off the league lead - with just eight interceptions. Winnipeg native Andrew Harris was also an offensive force, leading the league in rushing (1,035 yards) and receptions (105). Nichols completed 56 of 72 passes for 628 yards and three TDs versus Edmonton this season. Harris accumulated 159 yards rushing on 19 carries and 17 catches for 201 yards. Edmonton's Mike Reilly led the CFL in passing yards (5,830) and was tied for most TD strikes (30). He also finished 11th in rushing with 390 yards and a league-best 12 touchdowns. Brandon Zylstra of the Eskimos led the league in receiving yards (1,687) on 100 catches with five TDs. Reilly was 51 of 79 passing for 667 yards and four TDs with an interception versus Winnipeg this season. Zylstra only faced Winnipeg once - in the loss in Edmonton - registering nine catches for 152 yards. The Eskimos have been road warriors this season at 6-3, good for a tie with Winnipeg for the CFL's second-best road record behind Calgary (6-2-1). The Bombers are also 6-3 at Investors Group Field. CARTER FLASHBACK: The Ottawa Redblacks will certainly remember the last time they faced Duron Carter. Ottawa begins its Grey Cup defence by hosting Saskatchewan in the East Division semifinal Sunday. The two teams split their season series 1-1, winning each game at home by a point. Saskatchewan won the first matchup 18-17 on Sept. 29, earning starter Kevin Glenn his 100th career victory. The Redblacks won the second encounter 33-32 on Oct. 13, erasing a 12-point deficit to clinch a playoff berth with Ryan Lindley's one-yard TD run on the game's final play. Carter had 11 catches for a career-best 231 yards. Carter finished the season as Saskatchewan's receiving leader (73 catches, 1,043 yards, eight TDs) and also made headlines playing cornerback, returning an interception 43 yards for a TD in 30-7 win over Calgary on Oct. 20. OTHER STATS: Despite ending the regular season with three straight losses, the Calgary Stampeders finished the regular season as the CFL's stingiest defence. Calgary led in fewest offensive points allowed (16.7 per game), touchdowns (35) , passing TDs (17), yards (314.7 per game) and most quarterback pressures (125) while finishing tied with Toronto for most sacks (50). B.C. 's Solomon Elimimian led the CFL with a record 144 tackles, breaking his previous mark of 143. Saskatchewan's Ed Gainey had the most interceptions (10), Calgary's Charleston Hughes registered a league-high 11 sacks while Ottawa's Keelan Johnson accumulated 29 special-teams tackles. Calgary's Roy Finch recorded a league-best three punt-return TDs while leading the CFL in return yards (1,200) and average (16.4 yards). Winnipeg's Justin Medlock was the CFL's scoring leader (226 points) but Calgary's Rene Paredes was the league's most accurate kicker (53 of 58 field goals, 91.4 per cent). Toronto's S.J. Green, who missed most of last season with a knee injury, led the CFL in most 20-yard catches (23). Hamilton's Brandon Banks had his streak of 100-yard receiving games snapped at five in the Ticats' 33-0 season-ending win over Montreal on Friday. But his seven catches for 76 yards gave him 67 receptions for 1,011 yards, his first-ever 1,000-yard campaign in the CFL. Banks was one of 14 receivers to crack the 1,000-yard plateau while three running backs (Winnipeg's Andrew Harris, Calgary's Jerome Messam and Ottawa's William Powell) ran for more than 1,000 yards. Chris Rainey of the Lions had the most combined yards (3,181) while Harris accumulated a league-best 1,892 yards from scrimmage.